A cultivar of Camellia japonica L. ‘Alba Plena’ is an erect shrub with light green foliage and medium, formal double white flowers, to 10cm across, the petals ‘being disposed in circles from the circumference to the centre, and lying perpendicularly flat and even one above the other.’ [ABR pl.25/1799]. ‘This is without doubt, one of the most beautiful and splendid plants which has ever been cultivated any where: it is a native of Japan and China, those countries so renowned for magnificence in flowers; it has probably been known for ages, but in England is but of comparatively novel introduction: twenty five years ago it had never been seen here, since which time its beauty has caused it to be most industriously propagated.’ [LBC no. 269/1818]. ‘The double white or Bourbon Camellia is, in our opinion, by far the most beautiful. 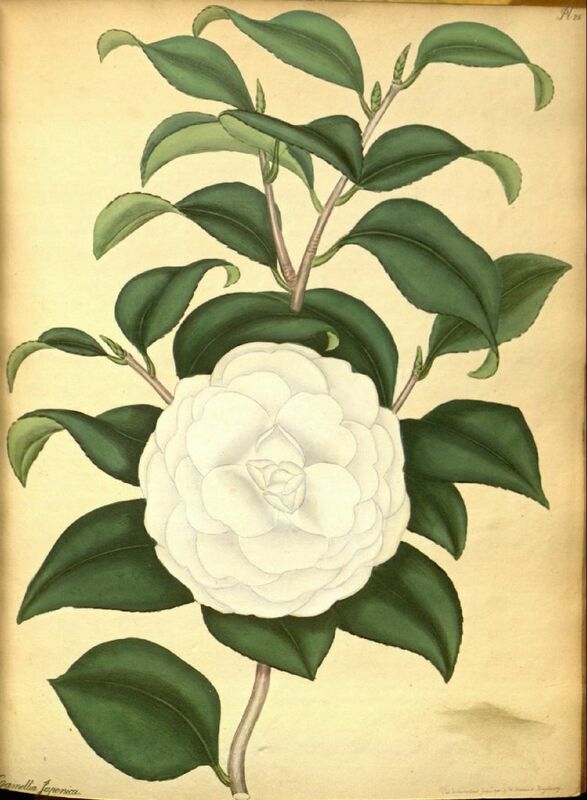 Nothing can exceed in elegance a large tree of this kind, covered with beautiful snow-white double blossoms, embosomed amidst the bright green shining foliage; such as we remember to have seen with delight two years ago at the Northampton Nursery, Balls-Pond.’ [BM t.1654/1814]. Listed in all published catalogues [T.192/1843]. Received per ‘Sovereign’ February 1831. [MP A2948-2]. Plants were presented to the Sydney Botanic Garden on October 24th 1846. [RBGS AB]. Alba plena is listed in both the 1830 and 1836 editions of Loddiges’ Nursery catalogue, copies of which are held at Camden Park [CPA]. In the 1830 edition it is marked with a ‘+’, the meaning of which is unclear. In 1836 it is marked with ‘o’ containing a ‘c’. The ‘o’ usually denotes new to the colony and the ‘c’ grown at Camden.